What kind of content does Google want on your website? There's a simple way to find out. Know what kind of website content Google wants from you. 00:10 – What does Google want to see? James Schramko here with an SEO news tip. This week, I’m going to cover how you can find out what Google would like your site to be about. So here is an exercise: go to your website and have a look at some of the words on your page or perhaps your page title. Type in your main topic into the Google search box, then scroll down to the bottom of the page and see what the related searches are. That’s what Google would like to see on your website where relevant. So let’s just take an example. We would search for “office equipment” – that might be a search phrase. And then, we will scroll down to the bottom of the page and we will see what the related phrases are. Now, if I was in that business and I had any of these related searches, then I will be making sure that I make one page per related topic and then I’ll make sure these are findable with my navigation structure on my website. That way, Google is getting a really good feel for what your site is about and it’s relevant. The next step of course is to put really useful content on each page (pictures of what the page is about, descriptions, specifications, a clear call to action of what you’d like people to do) and now you’re cooking. 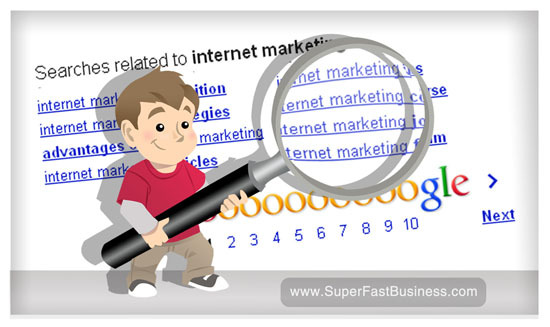 You’ve got a good website with good SEO that is valuable for a human. You might even get the phone to call or forums filled out or someone ordering something if you keep doing this. If you could do this 10 times a week, you would end up with a huge website in just one year from now. So go and do the exercise. Go to Google, type in the phrase that describes your business in the same sort of detail that someone searching for your business would use. Scroll down to the bottom of the page and see what the related terms are, and start building out your website. Well, I’m James Schramko, catch you again soon. Thanks James. Good tip. On some results, that related searches list doesn’t appear BUT Google does offer other related terms with Google Instant, related results appear as you’re typing in the search term. Also James, what plugin are you using for that orange popup box for “7 Part Business Growth Training Course”? Cheers. Terry great tips. (instant is a great way to fish for keywords). (Our web team modified the plugin code to trigger a little earlier because with long comments posts it takes a while to pop). Good stuff and a great reminder that SEO doesn’t have to be all that technical. I enjoyed the return of the t-shirt as well! Awesome tip James! I’d never have thought of that but it makes sense. I am going to go and add the pages fit now! This is really awesome tips. Actually, I already thought about this before but I didn’t gave weight about this technique in most of my niche sites. Thanks for your reminders. From now on, I will surely give what Google wants. More power! Thanks James. You make it sound so easy (which it is, just takes work right!). Terry, I’ve been doing the same with Google Instant, but never the bottom terms. Great information as usual. I’ve always wondered what’s the best way of finding categories for a site, any ideas? FK – try Wikipedia. See how they break your topic into categories. Another great tip. Thanks James. Actually, reminds me bit of a good old Google wonder wheel – they clearly tell you what they want. Such a simple, but easy to overlook way to find out what associated topics you can talk about relative to your niche – the 6 or 8 related subjects at the bottom of the Google search can give you enough ideas for your blog content to last for ages. Great idea! I am wondering if it would work just as well to create a blog post for each topic on the blog page of my website. I am having a tough time getting my head around how to create all of these extra pages on my site without cluttering up the clean design that I have. Any feedback would be much appreciated. Thank you! That is what I do. Each blog post is generally an answer to a question.